Recycling Equipment & Machinery Market size will reach USD 1.2 billion by 2025; according to a new research report by Global Market Insights, Inc. Recycling equipment & machinery are generally used to process & separate materials collected by recycling products such end of life tires, electric components such as mobiles, electric motors, e waste, plastic bottles made of PET, engineering plastics, end of life vehicles, paper & wood products. The recycling equipment & machinery market is majorly driven by the rise in awareness & consciousness of industries such as automotive, industrial machinery, building & construction about the benefits of use of recycled materials in their final products. The need to urgently curb green house emissions has also resulted in development of eco friendly materials which will reduce the carbon foot print globally. In addition to this, stringent laws & regulations imposed by local governments especially in developed regions of Europe & North America will fuel the recycling equipment & machinery demand. Baler press is the most widely used machine in the recycling industry. Almost 30% of the overall recycling equipment & machinery market is dominated by baler presses. These presses are widely used in bailing almost any material such as plastic, scrap metal, rubber, iron & steel efficiently & are available in vertical & horizontal configuration. Among all applications, metal bailing is one of the fastest growing application for this type of recycling machine. This segment will cross USD 390 million by the end of the projected period, increasing at a CAGR over 5.7%. Plastic is the largest recycled material globally after ferrous materials. Almost 8.5 billion tons of plastic is manufactured yearly of which almost 6 billion tons of plastic goes waste. Only 10% of this wasted plastic gets recycled every year. With rise in regulations in Europe & North America regarding landfilling of plastic & use of bioplastics, the demand of plastic recycling equipment & machinery is anticipated to rise at a noteworthy rate during the forecast period. This segment would surpass almost USD 470 million by 2025, at a CAGR over 6.3%. Asia Pacific is the largest market for recycling equipment & machinery as majority of plastic recycled is imported & processed in China. Other important market for recycling equipment & machinery are South Korea, Malaysia, Singapore, Thailand, Australia. 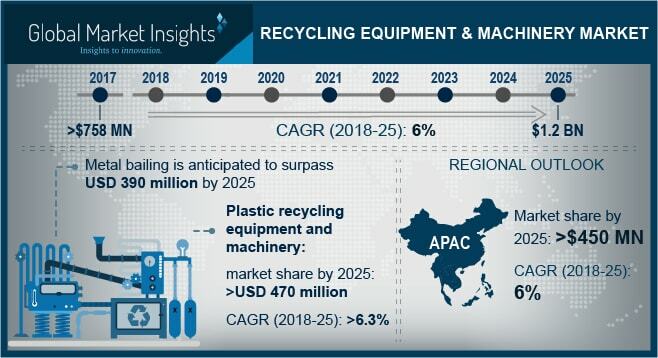 Asia Pacific recycling equipment & machinery market will grow at a CAGR of 6.0% and will surpass USD 450 million by 2025. Key players present in recycling equipment & machinery market include Panchal Plastic Machinery Private Ltd, Danieli Centro Recycling, Lefort, Morita Holdings Corporation, BHS Sonthofen, Forrec Srl Recycling, Idromec Spa, Mid Atlantic Waste Systems, Suny Group, Roter Recycling, Vecoplan AG, Shred-tech Corporation, Gamma Meccanica SPA among others.